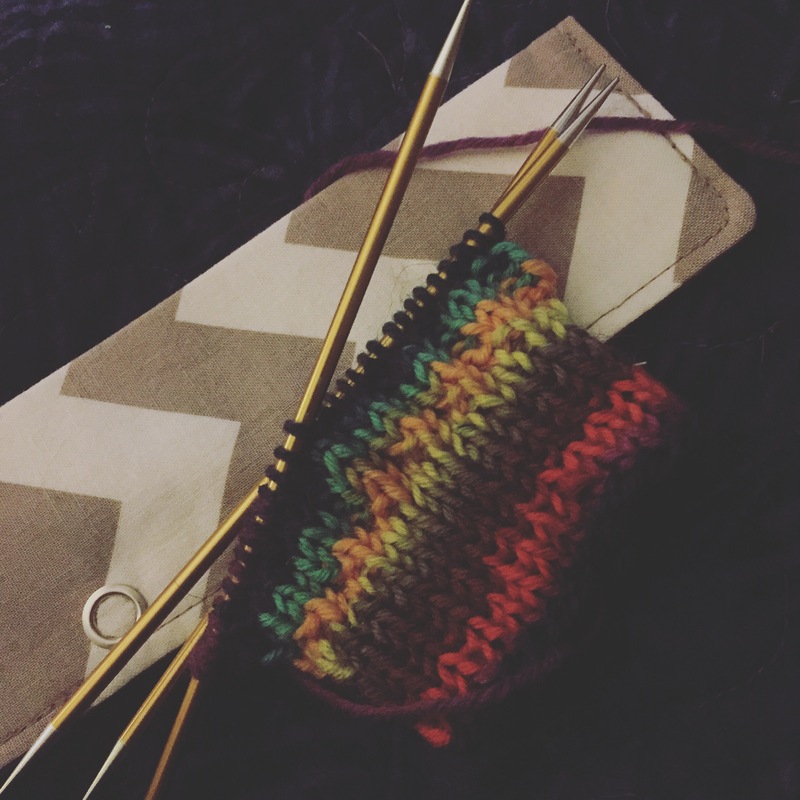 It’s the middle of February and so far in the very casual Socks with Sarah KAL this year I’ve finished 2 pairs of socks and have one more pair about 2/3 done. 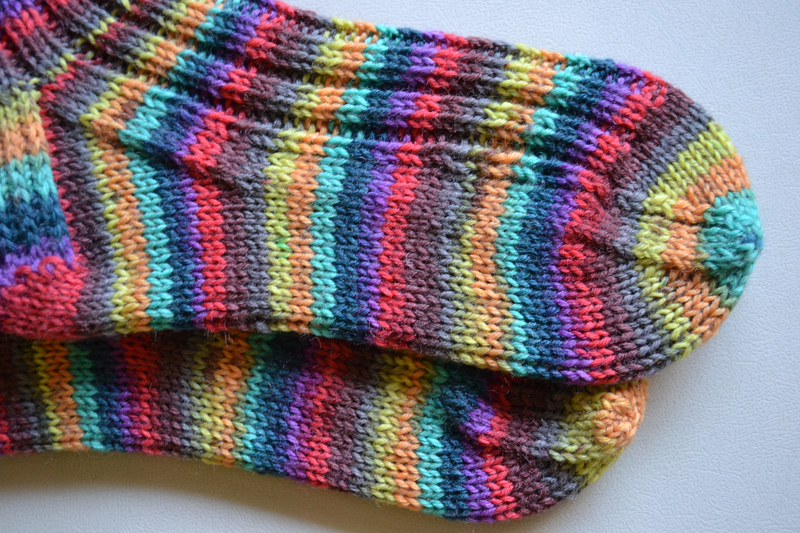 Today I get to show you that second finished pair — hooray! I guess technically speaking they are the first pair I cast-on, but for whatever reason they were eclipsed by my Rey socks. It happens, you know? 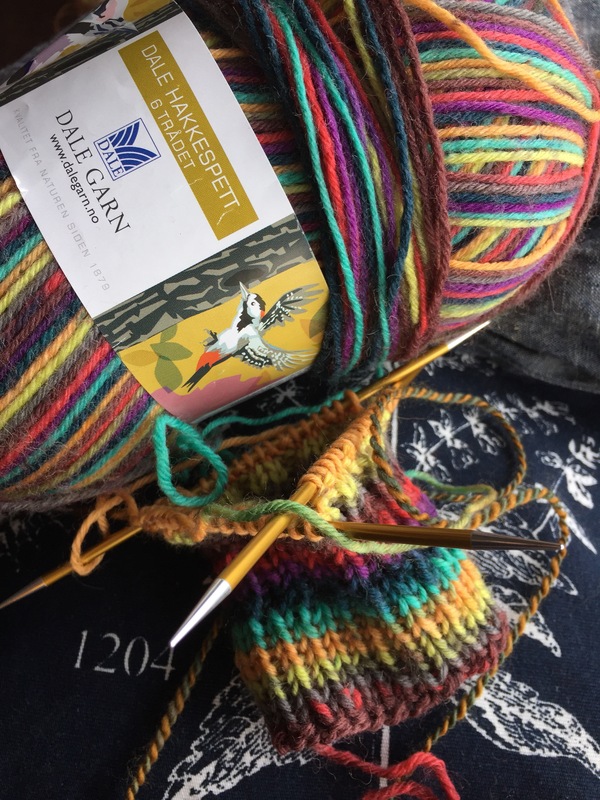 I got this yarn at the Thanksgiving holiday when the kids and I took my parents up to Door County for lunch at my daughter’s favorite restaurant, Kitty O’Reillys. Right down the street, seriously less than a block away in Spin of Door County, so my mom and I popped in and I picked up this skein. My thoughts when I made my purchase were 1) I’m amazing for buying only one skein of yarn and 2) I can make socks for my daughter with this. It turns out, the former is certainly true, but I instead decided to make socks for myself with it. And you’re through the heel. And the first sock is finished. 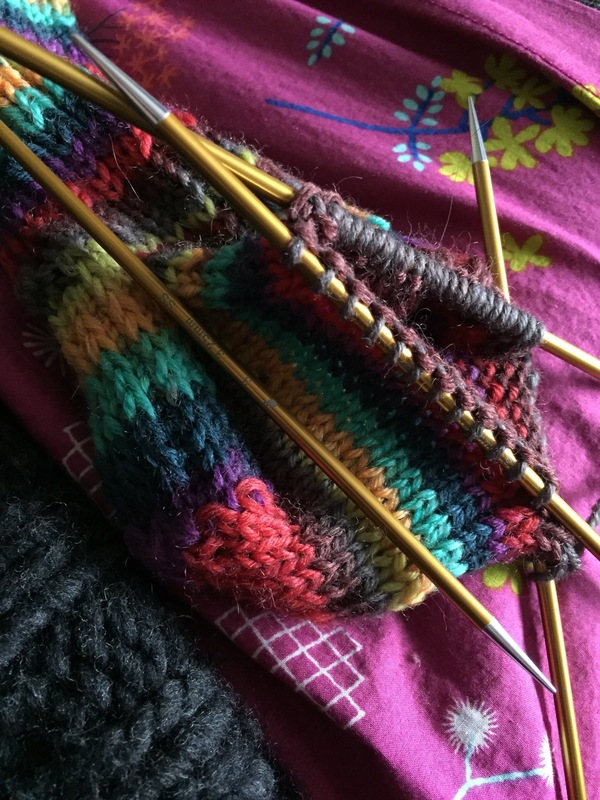 I set it down while we did vacation and then I finished up my Rey socks… and a shawl… and a couple skeins of handspun. And then I picked it back up. I’ll say I never really used DPN holders, but my Signature needles have the habit of poking through my project bags and I’m a little terrified of jabbing myself accidentally while in transit so I’m gotten a couple. I have two now and I got both from this shop. I’m weird about these things because I’m less concerned with aesthetic here and really interested in function. These are well made and simple. They ship fast and do the job. Mine are both this simple white and grey chevron, one is lined in blue and one is lined with pink. Simple, perfect. 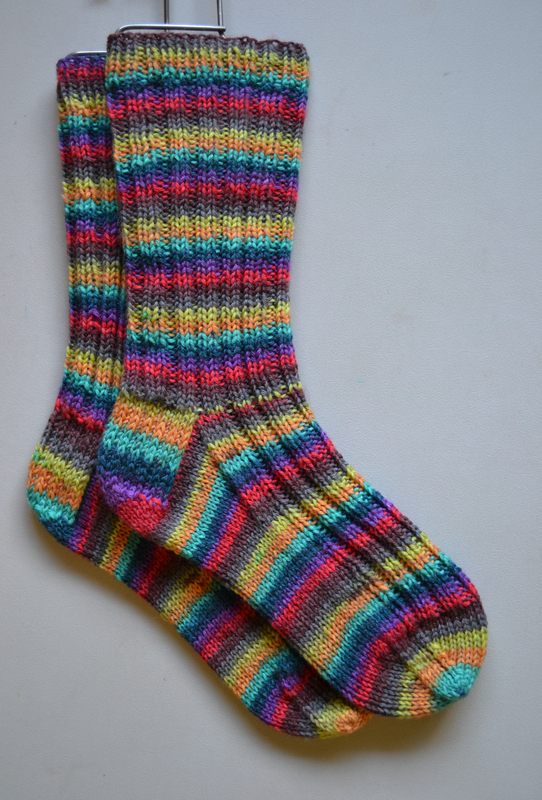 And I have finished socks. They’re bright and so fun. I was really pleased with how the Dale Garn Hakkespett yarn knit up. It’s a lot like a sport weight Regia, so that nylon blend that makes great socks. 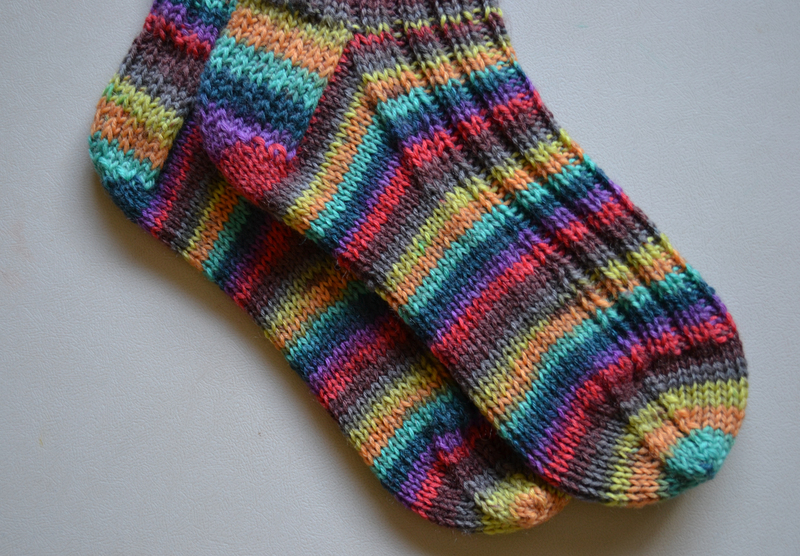 As per my normal for vanilla socks, I used the Churchmouse Yarns & Teas Basic Sock pattern. I know it almost by heart, but I finally bought an electronic version (as opposed to the paper copy I’ve had for years) so that I could easily access it any time. I sometimes knit these on a US 2.5 needle, but since these will probably be machine washed and dried, I knit them on a US 3. That gives them a little room to shrink in the dryer and should make them absolutely perfect after 1-2 times through the wash.
I’m already well on my way with my third pair of socks this year as I’m about an inch from the heel. For me and handknit socks, once I get around the heel things tend to snowball so it shouldn’t be long now. I wound two other skeins already for socks in my wishful thinking/indecision of vacation planning last month, so starting the next project will be easy when the time comes, too. It would be easy to wind ALL THE SOCK YARN here, but I’m trying to knit what I wind to minimize the mess I make in my stash. It seems to be a solid plan so far. I’m also happy that I’ve managed to keep the sock knitting from falling into the “obsessive” category. I have them going, I work on them from time to time, but other things are happening, too, on my needles and on my wheel. 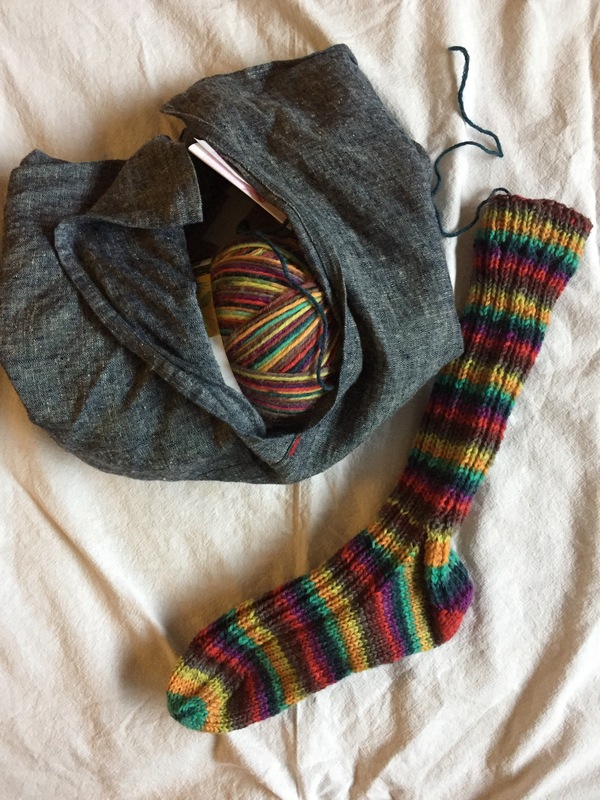 So Socks with Sarah 2017 rolls onward, accomplishing goals in moderation. And that is something, I’m very, very happy about. I absolutely LOVE this yarn! These are sure to make you smile on a cold, gray day. Makin’ me smile right now! Love those colors and the texture looks great. I might have to find me some of that. It’s really nice yarn! And the texture is just a simple 2×2 rib on the cuff and top of the foot. They are super cozy for cooler days!